Here is some documentation of the Bushwick Augmented Reality Intervention 2010, which was part of the 2010 Beta Spaces Exhibition. Will and Mark worked tirelessly on this project, and as I understand it, the work will remain up indefinitely. ” Imaging Place: The Choragraphic Method,” Rhizomes, Vol. 18. “Place and the Electrate Situation,” Rhizomes, Vol. 13. 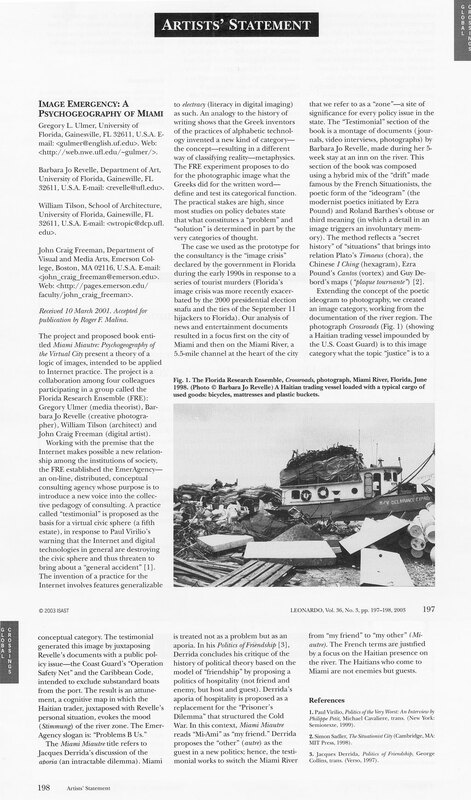 “Image Emergency: A Psychogeography of Miami,” Leonardo, Vol. 36, No. 3, pp. 197 – 198.